EURUSD WEEKLY OUTLOOK: STILL TIME TO RIDE THIS RALLY? Here’s what’s driving the pair. In most cases, news and trends that benefit stocks and other risk assets favors the EURUSD because the EUR is the higher ranking risk currency of the pair, and currency pairs move with their base currency (the one on the left). The strong entrenched uptrend on the weekly chart of most major global stock index (excluding the troubled GIIPS block) and what we see is a consistent picture of entrenched upward momentum that favor risk currencies like the EUR. While all three central banks of the three largest economies are openly committed to printing and debasing their currencies without any announced limit, only the Fed has actually begun its asset purchases fueled by money printing, to the tune of $85 billion/month. The ECB and BoJ have done nothing but promise to do so if and when needed. Meanwhile the ECB has achieved its desired calm and falling GIIPS bond rates, partly due to rising EUR strength, and the BoJ has gotten a cheaper Yen and rising stock prices, all without actually printing extra money or expanding their balance sheets with sovereign bonds of questionable real creditworthiness. See last week’s forex markets outlook here for details in the first section on the EURUSD. Granted, at some point in the not too distant future, Europe’s export driven funding nations that underwrite the EU, especially the EU’s paymaster, export-meister Germany, may want to end the rising strength of the EUR given the pressure the EUR’s rise is placing on exports. See here for an illustration, the Audi-Lexus Price Gap. Meanwhile, the rising EUR bolsters the false sense that the EU debt crisis is actually closer to a solution, and it also gives the EU a chance to let the Swiss National Bank unload the mountains of Euros it bought (in order to keep the CHF cheap enough to maintain Swiss exports to the EU, where 60% of Swiss exports are sold) and thus help the SNB prepare to soak up Euros once again if needed. This supports the EUR vs. the USD in two ways. There is virtual universal consensus that the US will grow faster than EU in 2013. A relatively healthy US supports risk appetite and thus the EURUSD. However, the recent US GDP contraction for Q4 2012, and its more ominous ramifications for total 2012 US growth (see here, in the Conclusions and Lessons section, for details) reduces those expectations and thus supports the belief that the Fed’s USD debasing policies will continue. It’s unclear why, but that’s what’s happening. For example, markets rise on good German data, but shrug off not only Italian, or Spanish data (arguably expected) but even signs of further slowdown in France, the EU’s #2 economy. Last week, anxiety that surprisingly large early repayments of LTRO loans would damage regional liquidity was eased when the ECB announced that only a limited number of banks (27) were involved. 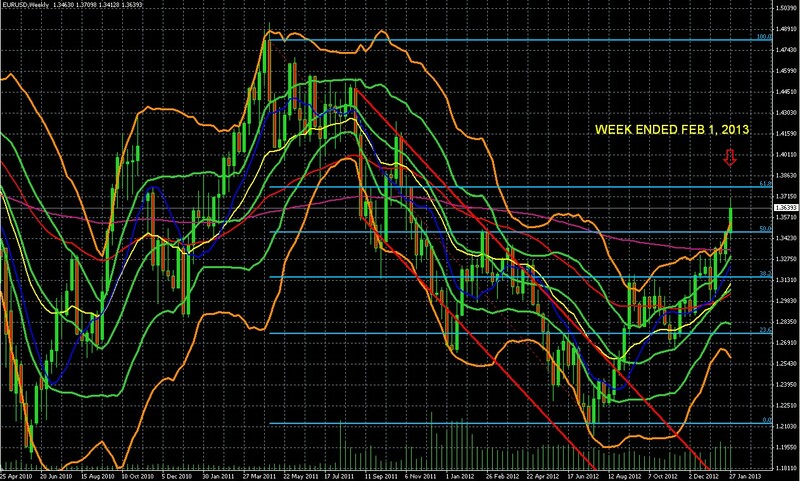 The weekly EURUSD chart reflects the near term fundamental picture. As we’ve seen with major stock indexes, the mere fact that an index is approaching long term support with long term upward momentum suggests the index will attempt to test and break above that resistance. The same goes for a currency pair like the EURUSD. Indeed this pair typically moves in close correlation to the S&P 500. EURUSD breaks above its double Bollinger band buy zone. Just being within the area bounded by the upper orange and green Bollinger bands suggests continued upward momentum. Price has actually broken above it, which shows exceptional strength. See this link for brief explanation of how to read double Bollinger bands. The pair has decisively broken passed very long term, and thus strong, resistance of the 200 week EMA (violet) at the 1.3340 area, as well as the 50% Fibonacci retracement line around the 1.350 area. What Will It Take To Reverse The EURUSD Uptrend? 1. General Risk Aversion That Feeds USD Safe Haven Demand: The only question is when, not if, this will come. Resistance at the decade highs for risk assets, like the 1553 area for the S&P 500 finally outweighs the above bullish factors. This is quite possible given that the underlying fundamentals like global growth, employment, housing, debt/GDP levels, etc, are far worse today relative to the last times the S&P 500 or other major indexes were at such lofty levels. Next Bout Of EU Crisis Anxiety: There are any number of potential sources. Leading candidates include: Greece, Spain, even little Cyprus can potentially spark contagion concerns. Remember, German PM Merkel faces re-election in September, has recently suffered a surprise loss in an important regional election, and so is less able to risk the wrath of German taxpayers with new transfers to peripheral nations or new debasement of German savings accounts. This is particularly true for Cyprus, the next one in need of a bailout, because those funds would go to support banks that are used by EU tax evaders, making a German-funded Cyprus a harder sell. These ultimately stem from the immature nature of the EU as fully fledged currency union that still lacks the level of political will to submerge state sovereignty in order to integrate as a single economic entity. As we’ve discussed before, we remain skeptical that the culturally diverse states in the EZ are willing to truly ceded control over their destiny to a central budgeting body at this time. All the talk about EU stabilization is just that, talk. Nothing is fixed, the problems have merely been deferred by lending more money to those who are unlikely to repay it (at least not in Euros that are worth anything like what they are today). The EU is not yet stabilized. It’s just that the immediate solvency threats have been deferred. Assorted geopolitical threats simmering in the Middle East and Asia. As noted above, at some point the EZ’s funding nations, which depend on exports, will need to ease the EUR lower. We’ll know more about that this Thursday after the ECB’s monthly rate statement and press conference. Given how fast the EURUSD has risen, don’t be surprised to see some profit taking in the days before the meeting. We don’t think markets will be surprised if ECB President Draghi makes some attempt to talk down the EUR into a more moderate increase, as long has he avoids using extreme language about the EUR’s strength threatening the EU’s recovery, combined with equally strong words about the fragility of the EU. EUR: Spain and Italy Services PMIs. Individually these are second tier data, but if both surprise in the same direction they could be market moving, especially if positive (markets paying more attention to positive EU data). EUR: ECB rate statement and press conference – insofar as it provides any hints about changes in ECB policy. The uptrend likely remains intact for the coming week and beyond. However when we consider that not only the GIIPS but even Holland, France and the UK are already in or near recession, and that the GIIPS are living on borrowed time and money, we must view the current EURUSD move as a normal shorter term rally within the prevailing longer term downtrend. As we see from the chart above, that downtrend remains firmly intact for the foreseeable future, backed by the reality that the EZ has not yet achieved a level of integration needed to prove its permanence. Assuming the political will exists in the EU to sacrifice national sovereignty to some kind of central budgeting and economic regulatory and taxation body, achieving that level of integration will take years. The only chance the EU has to buy that much time is to print money in order to keep the weaker members liquid, even if they aren’t technically solvent. That means anyone whose wealth is based in EUR needs to diversify into healthier currencies or assets linked to them. The same goes for those with most of their wealth based in USD, CHF, JPY, or any other currency of a nation likely to be called on to contribute aid to keep the EU afloat. See here and here for the most up to date guide to simpler, safer ways to achieve that diversification than generally found in guides to forex or foreign investing. ← Last Week’s Lessons For This Week: Does Rally Still Has Life?